Something feels off in Destiny—and it's not just Peter Dinklage's delivery. On Wednesday, I started playing Activision's much-hyped new shooter for the first time alongside some co-workers (jazz aficionado Kirk Hamilton and middle-school dropout Sam Biddle). Though I don't normally play a lot of shooters—as most of you know I'm more of a turn-based kinda guy—there was just something about Destiny that made me want to go out and use warlock magic on waves of aliens. So the three of us played, shot through monsters, made fun of what is perhaps the worst writing I've ever seen in a video game, and just generally had a good time for a few hours. Then I asked if we could invite a couple of other friends. "No," Kirk said. Our squad is limited to three people. 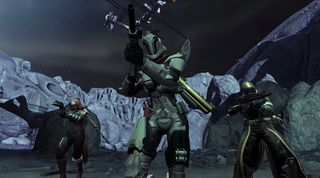 Destiny is, in theory, a cross between a first-person shooter and a large-scale MMORPG. As Bungie described it back when they announced the project in early 2013, it's "the world's first shared world shooter." And in many ways, that's true: as you're traversing planets and shooting up baddies, you'll run into random players often, much like you would in a standard MMORPG. Destiny's world feels shared in a way that most other multiplayer shooters—like, say, Borderlands 2—don't. So why can I only share it with two other people at a time? Tina already wrote about how lonely it is to wander the worlds of Destiny when the chat options are so limited, and she's spot on, but I think the three-person squad limit is an even worse problem. How many groups of four or five friends have spent months looking forward to Destiny only to find out they can't actually play together? How many people came into this game expecting to form big teams—like you can in just about any other MMO—and use teamwork to take on missions, with players coordinating to do more than just shoot enemies? Granted, Bungie's got a lot planned for this game, including regular six-player endgame raids, which will start opening up on Tuesday. But it takes a lot of hours to get to the endgame. Why force groups of friends to split up on the way there? I reached out to an Activision rep yesterday for an explanation on why they chose to limit squad size to three, but never heard back. Presumably it's got something to do with difficulty and map design. Still, it's a head-scratcher. When I was in college, I spent a few months grinding through World of Warcraft. This was not particularly fun. Back then—during the Vanilla days—the real game started at level 60, and to get there, you had to take what seemed to be a non-stop series of quests to fetch scalps and hunt down animal pelts. But we could mitigate the grind by teaming up with friends and randoms in groups of five. Five! Not too big—not too small. Really, the perfect number for random missions and level-grinding. I expect a lot of Destiny's features to change over the next few weeks and months—and hopefully one of those changes will be squad sizes. If Bungie really wants this game to feel like a shared multiplayer experience, they need to let us play with more people.